TORONTO--(Marketwire - Oct 31, 2012) - Social media has changed the way customers behave and the way businesses sell. Traditional lead-generation techniques such as paid advertising are evolving into relationship-building and real-time responsiveness as social networks connect and empower consumers. To help marketing, sales, customer service and other public-facing company departments take advantage of the opportunities this new social landscape offers, business intelligence leader Sysomos published "How to Generate Leads through the Social Web." This practical tip sheet offers five solid strategies supported by real-life examples to help companies leverage social media for their own sales lead generation effectiveness. The social web has become today's biggest customer complaint box. Monitoring competitive brand names and products can yield a treasure trove of dissatisfied customers who are perfect new business prospects. Before engaging in social media, businesses should always use a social monitoring tool to see who is talking about their industry, company and products. It will not only reveal those looking for a solution to a problem that their organizations can solve but will also guide them in creating the most appropriate messages. Although blogs have lost some of their appeal in the heyday of Twitter and Facebook, they are excellent sources of contacts and sales leads. Target audiences are more likely to engage with a company and complete a lead-capture form to access it if the company provides content that generates excitement and offers a clear solution to their problems. By incorporating social media into traditional marketing activities such as email, event participation and newsletter distribution, target audiences have more ways to engage with an organization, which helps move them further down the sales funnel. "How to Generate Leads through the Social Web" is the third in a series of Sysomos Tip Sheets published through the end of 2012 to help marketers leverage social media monitoring to advance their businesses. The next Tip Sheet, "20 Social Media Resolutions for 2013," highlights best practices that will contribute to business success during 2013 and beyond. 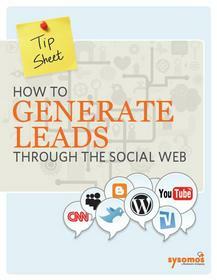 Download a free copy of "How to Generate Leads through the Social Web." Through the use of contextual text analytics and data mining technology, Sysomos collects data from blogs, Twitter, social networks, forums, video sites and major news sources. New tip sheet from Sysomos offers practical advice for leveraging social media to generate new business opportunities.